Ambitious and encouraging, this text for prospective and practicing elementary and middle school science teachers, grounded in contemporary science education reform, is a valuable resource that supplies concrete approaches to support the science and science-integrated engineering learning of each and every student. At its core, it is based in the view that science is its own culture, consisting of unique thought processes, specialized communication traditions, and distinctive methods and tools. Using culture as a starting point and connecting it to effective instructional approaches, the authors describe how a teacher can make science accessible to students who are typically pushed to the fringe—especially students of color and English language learners. Written in a conversational style, the authors capture the tone they use when they teach their own students. The readers are recognized as professional partners in the shared efforts to increase access, reduce inequities, and give all students the opportunities to participate in science. Features an entirely new chapter on engineering and its integration with science in K-8 settings. Provides fresh attention to the Framework and Next Generation Science Standards while distancing previous attention to process skills and inquiry teaching. 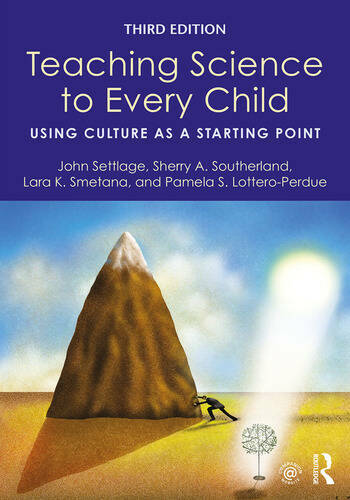 Incorporates the latest research about science practices, classroom discussions, and culturally responsive strategies. Retains an accessible writing style that encourages teachers to engage in the challenges of providing equitable and excellent science experiences to all children. John Settlage is a Professor at the University of Connecticut. He coordinates the local STEM Teacher Preparation and is a Co-Editor of the Science Education journal. Sherry A. Southerland is a Professor at Florida State University. She is a Co-Editor of the Science Education journal and is a mentor to doctoral students and fellow faculty. Lara K. Smetana is an Associate Professor at Loyola University Chicago and teaches elementary science methods. Pamela S. Lottero-Perdue is a Professor at Towson University where she teaches science and engineering methods and directs an elementary integrated STEM graduate program.